Almost wordless: Today is the anniversary of what many consider the birth of the modern environmental movement in 1970, and why many of us are now enjoying a healthier planet—cleaner air, water, and the resurgence of many threatened wild animal species. Nice photo! 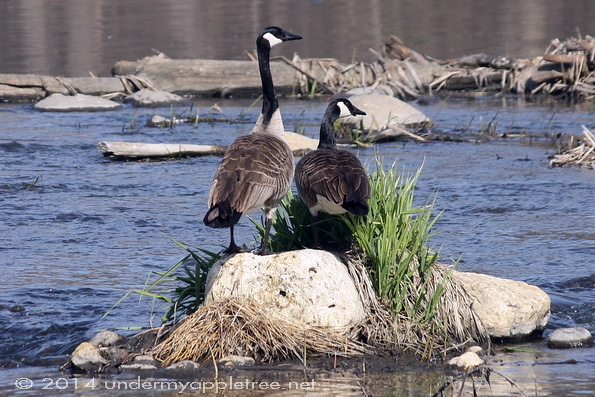 We have a pair of Canada geese nesting in our neighborhood. The images you post on your site help to remind us of the meaning of beauty in the natural world. Wordsworth thought pleasure–including that gained through nature–actually made people better, by making them more hopeful and generous. I think he would praise you for giving others pleasure, through greater awareness of nature. Thanks. I feel fortunate to live in an area that has so many beautiful nature preserves and trails, and many of them are public space and open to everyone to enjoy. Great capture! And happy Earth Day. Very pretty. Thanks for sharing your photo. OMG. Canada geese are so annoying, and quite vicious. 😦 We get a sh*t ton of them here in Newmarket. They can also be quite messy, but they are pretty to look at. I agree. And we are still recovering from the Exxon disaster too. This could easily be outside our front door looking at the DuPage River. We have assorted wildlife of many varieties, most which wish to eat my husband’s gardening efforts. But, aren’t they beautiful to look at?! I gave up and fenced the veggie garden and moved the herbs to raised barrels, but I do enjoy the wildlife visiting my yard even if they eat a flower or two. That photo was taken on the east branch of the DuPage River at Churchill Woods.